This morning I had an opportunity to work with students in the field for a couple hours on the Johns Hopkins Homewood Campus. I only made a couple images as I was busy helping students with their cameras. 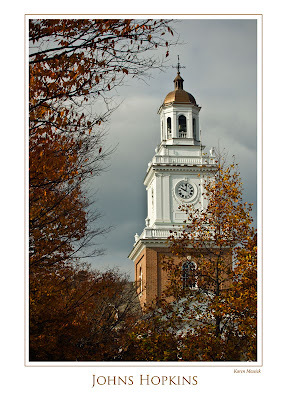 However, I could not pass up the beautiful clock tower framed by the last of fall colors. I wanted to spend some time after the class shooting, but it was after 12:30 and the light was getting a little harsh. Hopkins Homewood campus is beautiful. Dad graduated from Hopkins with a degree in business, after he attended night school while working full time. I remember attending his graduation outside on the covered portico on the hill many years ago. It was nice walking around the campus this beautiful morning. First things first: why the extra "S"? Because his first name was really a last name. Johns Hopkins' great-grandmother was Margaret Johns, the daughter of Richard Johns, owner of a 4,000-acre estate in Calvert County, Md. Margaret Johns married Gerard Hopkins in 1700; one of their children was named Johns Hopkins. The second Johns Hopkins, grandson of the first, was born in 1795 on his family's tobacco plantation in southern Maryland. His formal education ended in 1807, when his parents, devout Quakers, decided on the basis of religious conviction to free their slaves and put Johns and his brother to work in the fields. Johns left home at 17 for Baltimore and a job in business with an uncle, then established his own mercantile house at the age of 24. He was an important investor in the nation's first major railroad, the Baltimore and Ohio, and became a director in 1847 and chairman of its finance committee in 1855. Hopkins never married; he may have been influenced in planning for his estate by a friend, philanthropist George Peabody, who had founded the Peabody Institute in Baltimore in 1857. In 1867, Hopkins arranged for the incorporation of The Johns Hopkins University and The Johns Hopkins Hospital, and for the appointment of a 12-member board of trustees for each. He died on Christmas Eve 1873, leaving $7 million to be divided equally between the two institutions. It was, at the time, the largest philanthropic bequest in U.S. history. When Johns Hopkins died on December 24, 1873, he left $7 million to be divided equally to found a University and a Hospital, both bearing his name. To the University, he also bequeathed his country estate, Clifton, in the expectation that the rolling 300- acre site would become the campus. 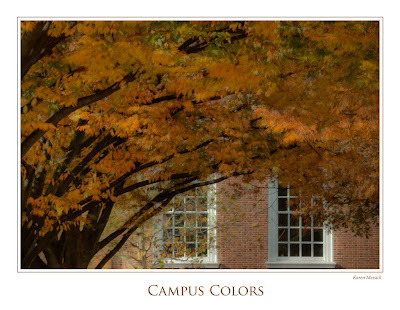 Hopkins's will forbade the trustees to pay for buildings out of the endowment, but the income from the principal was not enough to attract quality faculty and students and create elm-shaded quadrangles as well. Thus, the trustees decided to acquire a temporary site in downtown Baltimore, near the Peabody Library, to house the University until enough capital was accumulated to construct a campus at Clifton. Toward this end, the trustees purchased a lot between North Howard Street and North Eutaw Street, improved by two residences that were converted into a single structure, known as the Administration Building; behind this the University erected another building, named Hopkins Hall. These two buildings comprised The Johns Hopkins University when formal instruction began in October 1876. I think if Johns could see what has grown from his philanthropic behest he would be mighty proud!